So that drugstore makeup finds post that was suppose to go up today, thrown out the window. 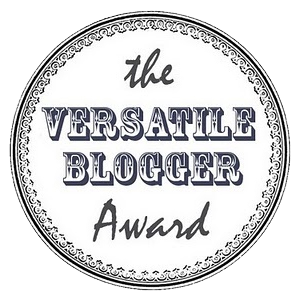 I was so thrilled to learn that Asja over at Beauty Ignited nominated me for the The Versatile Blogger Award and I just had to get my post up ASAP! Go check her out, she's awesome and I love reading her empties series the best, plus her makeup collection show case posts had inspired me to do some too! Thank you so much for the nomination Asja!! 1. I tend to let things pile up all week but every Sunday I can't go to sleep until everything is spotless and fitted neatly back into its proper place. 2. Since I was 3 years old I've always had at least one guinea pig. There was one point in which I had five little piggies at once but now I'm down to just one and I don't think I ever want to live my life without one of these chubby little snuggle bugs ever. 3. I could live the rest of my life strictly on a diet of french fries and soup. 4. A combination of poor hand-eye/hand-foot coordination and depth perception issues makes me a huge liability playing any sports. 6. I have a serious addiction to reality TV. I'm fully aware that everything is painfully scripted but I just can't get myself to stop watching it! 7. I have a nearly crippling fear of latex (I know, very specific) balloons and butterflies.